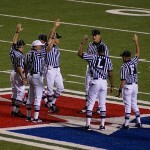 On September 23 of every year a group of men who referee low level football games get together for some hi-jinks in the City of Baltimore, but this year their antics were rudely and repeatedly interrupted by huge men in football uniforms who called themselves the Ravens and the Patriots. Jon Sloan, head of the organization “Low Level Refs of America” said that he and about 7 or 8 other members of the group meet in Baltimore every year at M & T Bank Stadium and “just goof around” with a bunch of footballs and the sticks and chains. We have TV cameras record these long ridiculous arguments we have about the rules of football, and so on, and we usually watch them later at a big party we throw. It usually takes us about five hours to do all the crazy things we do. But this year, these huge rowdy guys kept running up and down the field, kicking, passing and running with the football as if we were not even there! There was a massive crowd in the stands for some reason and they kept yelling at us to throw these little yellow flags we had. But we were too afraid to thrown them because those guys looked so big and mean. © Copyright 2012 The Weekly Weasel. All Rights Reserved.